The BrewLab Basic® water testing kit, model 7189-01, for home brewers quantiﬁes 6 important water test factors. Experts agree water conditions affect your ﬁnal product, so take the mystery out of making great beer. Looking for a digital pH test? Check out the BrewLab® Plus! Trust LaMotte, the water analysis experts since 1919, to help you control your most important ingredient - water! 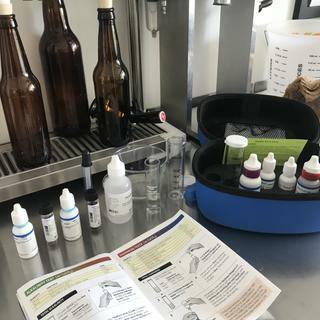 Visit HomeBrewFinds.com for a hands-on review of the LaMotte BrewLab water test kit. For more information on water and its role in the brewing process, check out John Palmer's Water, A Comprehensive Guide for Brewers. For help with water adjustments, download Palmer's Brewing Water Adjustment App, currently available for iOS devices and coming soon to Android. See the Documents Tab for additional information. I attended a Brew Camp and this was he kit used, seemed to have everything I would need. Moved to all grain & water quality & ph levels play a big impact to beer quality. So trying to understand my water source! My water varies month to month and "distilled" from the store has a pH under 6, so I need to know what is in it. Learned about it at the NanoCon Seminar a couple of weeks back. Seemed to be highly recomended by a lot of reviewers. I need to replicate my previous well water water profile since moving to the city. This kit allows a brewer to produce quick, fairly precise, water quality test results at a low cost. It looks like there are 2 brands out there. This one basic and affordable. Know the exact levels of brewing ions in my tap water. To test my water. La Motte sells refill kits, but evidently does not stock them. Reviews and online research looking for the best entry level water testing kit for brewing at home. I picked this to have accurate knowledge of my brewing water. I want to know my water. Be aware that you might get expired or close to expiring reagents in the kit. It seems they won't replace a item unless it's expired. This isn't a one time use kit. I purchased kit and received it a few days after black Friday. The Total Alkalinity Indicator expires 1/2019. First and last purchase with MoreBeer. Right on the Lamotte website it states that freshness of the reagents affect accuracy of tests. They list shelf life for each chemical on there website. Beware, aside from the initial purchase price, which is not cheep, you will need to continue to purchase chemicals that have a very short shelf life. When I purchased my kit, it came with the total alkalinity agent already expired. I called More Beer and they were great! Apologized and immediately sent a new total alkalinity agent out to me free of charge.The new one came and it only has 2 months remaining before it expires and needs to be replaced. I checked on the LaMotte website and this chemical only has a 6 month shelf life.Many of the agents as they call them in this kit, have a shelf life of 12 months, so when you get them they will have to be replaced in less than 12 months. So again aside from the original purchase price, you will be paying $5 to $10 every few months to replace expired chemicals.I know many brewers don't want to use their local water test reports because there is such a large range/variance throughout the year. However, I found that I can call or email my local water provider, and they will give me the most recent test results for my water for free. Do yourself a favor and call your local water provider, ask for their quality control manager, and ask if they can give you the most recent results. I am sure they will be happy to provide them for you,and they will do this several times a year. I wish I had done this first, because I now have a kit, that will expire shortly, and I have no use for. I got it to check my RO water. I was able to gain insight into different water sources and adjust the water for the different styles of beer. The quantity of supplies allows for numerous tests vs just a few. Hesitated on buying one of these kits since it’s inception. Well, needless to say, I just brewed one of the best beers I’ve ever brewed!! No more guessing!! Get one!! I appreciate what this kit measures, but the precision is lacking. It's generally in 10ppm increments, which is good enough to get by, but not good enough to improve on the annual report from my local water district. So it wasn't worth the money and I decided to return it after one use. The regent colors are also pretty dull in some cases and hard to tell when color has actually fully changed. If you can't get a district water report, this would probably work for you. If you can, there's no reason to get it. Easy to use and gets you results in 20 min first time. You can make it faster once you get comfortable with all the process. Overall - I like this kit. I don't have a lot of experience with other water testing kits, but it seems to work well and is pretty easy to use. The only thing I would change would be to include a color target. Many of the tests have you add 5/6 drops of a certain substance to the water under test, which will change the color to, say, purple. Then you are supposed add any number of drops required to change the color to say, blue. The hard part is that my perception of blue may be different than yours. Having a color target of the expected blue would be helpful to say that the water under test has reached the correct color. Now count the number of drops and that is your ppm concentration of the say chloride. Additionally, my sulfate test was almost indistinguishable from the 0-25ppm test, meaning it is anywhere in between. This makes it kind of difficult when trying to figure your sulfate / chloride ratio. Quite good. Easy to follow, but lacks a little on the accuracy. I would recommend this to any home brewer. A very useful tool to detect changes and variations on the water profile, easy to use and accurate. If you want to know the difference between a good beer and a outstanding beer!!! Excellent water test kit that allows you to understand your water chemistry and deal with it on brew day. So very easy to use with the included instructions and is a lot cheaper than having your water tested by a professional, who is going to use a similar technique. If you understand the importance of your water on your beer and you understand how to treat your water then you need to have this kit. I really liked the Brewlab. There was a very small learning curve, but the testing is very easy after the first or second time. Love this kit! I take regular samples of my brewing water to track changes over time. Much more convenient than shipping off samples to a lab. The kit has a very easy to follow guide for each water test. It’s very simple and well worth the money. I’ve gone through every test 7 times and I’ve used up probably 1/3 of the included solutions. Great directions make this kit easy to use. Instructions are well written and easy to follow. Test results were within range of reported values from water company and results have been consistent over multiple tests at various times of the year. Suggest using the higher volume marks (25 ml) on some tests to give higher test resolution. One note - the sulfate test readout can be a bit difficult to see in poor lighting. Admittedly $100 seems like a lot of money, but for the advanced brewer, I think this is a good deal. The quality of the kit is very high: the instructions are very easy to follow and not complicated. You also get a lot of reagent. That means that you'll be able to do a lot of tests. Doing tests repeatedly is a great thing, because water mineral content can change with weather conditions and changing water supplies. The tests themselves (if you follow the simple instructions) are easy and yield unambiguous results, and the results I got matched quite closely to a report from Ward labs. You will not get the full range of tests or quite the level of precision that you will get from an analytical chemistry lab, but the precision is well within the bounds that a home brewer needs. Finally, if you at all enjoy labwork, the tests are fun. All but the sulfate test use colored reagents and rely on titration. Doing the tests also helped me understand water chemistry a little better. This water test kit covers the six major factors in brewing, including the pH factors (alkalinity, calcium and magnesium) and flavor factors (sulfate, chloride and sodium). Using your test results with one of the online water spreadsheets allows you to target your water to the beer you are brewing. The tests are accurate to 10ppm precision, unless you have very high concentrations, in which case you can either dilute with distilled water or perform the test at 25ppm precision. There are five actual tests, but other factors can be reliably calculated directly from those results. Doing all five tests takes about twenty five minutes. Four tests involve dissolving a reagent in a graduated test tube (provided in the kit) which changes it to some bright color and then adding a different reagent, one drop at a time, and counting the drops to determine the ppm of the factor you're testing. Three of these tests are very easy to read; one (sodium) is pretty easy but not great. One test, sulfate, is different from the other tests in that you measure it by the opacity of the sample once the test reagent is added. I can't report on its ease of use because my local water has nearly zero ppm sulfate, which is totally clear. (I did try adding an unmeasured pinch of gypsum to that test and it went milky immediately, so it works, but I can't say how easy it is to read for practical purposes.) There is enough in the kit to perform at least 50 tests for each factor, so it should last me two to three years, and adds up to a $2 per batch cost. This kit is great for me. My municipal water variably draws from no fewer than seven sources, including mineral heavy wells and soft reservoirs. It changes throughout the year, sometimes suddenly: since June, when I made my first batch until now (two month later), I have seen an increase in 40ppm alkalinity and 30ppm in total hardness. This a pretty major difference in minerals and it makes mail in tests basically worthless. I'm greatful to have a better analysis available to me. Testing my brewing water is made easy with this. It is not easy trying to understand how water affects your beer. With this test i can adjust my water throughout the year depending on mineral content. Much easier than sending samples to a lab. 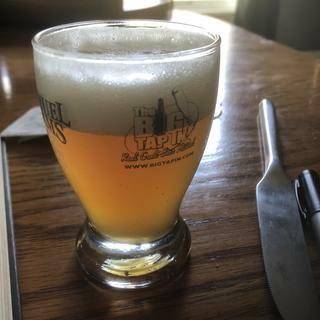 Helped me fix my beer! I bought this system since the beer I was making (all-grain) at my new place wasn't up to my usual standards. After testing my water with this kit I determined it was pretty much impossible to make a decent all-grain beer with my municipal water. It saved me tons of headaches. I also sent a sample in to Ward Labs and I confirmed that this test kit was dead-on. Highly recommended. I thought I had very good water, I live in Golden Colorado, and I have found out that my water chemistry changes by almost a factor of 2 with even minor rain storms. The complete test takes about 10-15 minutes and then you can run the numbers in Palmer's spreadsheet and peg your water profile. While I am not a lab person, I worked in labs while attending college, so I was interested in having the ability to do my own brewing water testing. 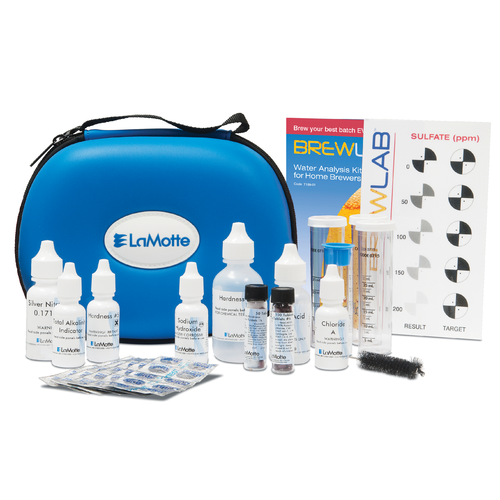 The LaMotte water test kit is fun and easy to use, reasonably priced, and gives the home brewer a chance to test brewing water anytime they want. Very happy with my purchase.